With the NFL Draft and free agency having come and gone, we’ll break down all sorts of fantasy-relevant questions entering the 2018 season. Up next is a look at whether the Kansas City Chiefs’ all-world safety can return from injury and continue to be a difference maker. The Chiefs made Eric Berry the league’s highest-paid safety prior to the 2017 season, signing him to a six-year, $78 million contract. And why wouldn’t they? Berry has worked as one of the league’s best safeties since being drafted with the No. 5 overall pick in the 2010 NFL Draft, earning Pro Bowl appearances both before and after dealing with a torn ACL and Hodgkin’s Lymphoma. Berry, a player with of the league’s most inspiring stories of perseverance, has doubled as the alpha dog of the Kansas City secondary for nearly a decade. He’ll once again be returning from a setback in 2018, as his 2017 campaign was short before the end of Week 1 due to a torn Achilles. We’ve learned by now to never underestimate what Berry is capable of, but just how much should we expect from the 29-year-old on a revamped defense? Berry has played in 87 of a potential 128 games during his eight-year career. The Chiefs haven’t suddenly transformed from an elite overall defense into one of the league’s worst units upon losing Berry, but their two worst defensive seasons of the Andy Reid era have each occurred largely without their All-Pro safety. One player does not make or break a defense. When Berry is active, the Chiefs have generally operated as one of the league’s better pass defenses – especially against tight ends. When he’s inactive, things haven’t been so pretty. Berry’s impact was made crystal clear against the Patriots in Week 1 of 2017 as he managed to take Rob Gronkowski almost completely out of the game. While they didn’t completely fall apart without Berry in 2010, 2014, and 2017, the Chiefs have never proven capable of fielding an elite pass defense without their stud safety. Berry possesses a scary-good combination of athleticism and range that allows him to thrive in coverage. He also possesses a linebacker’s mentality in the run game. Unsurprisingly, Berry’s presence has made a rather large impact in fantasy as well. The Chiefs have been a stingier defense during the Reid-era against quarterbacks, wide receivers, and tight ends in DraftKings points per game with a full season from Berry. Per our NFL Trends tool, the Chiefs rank among the league’s top-three defenses in Plus/Minus allowed to tight ends on both DraftKings and FanDuel since 2014. Even a lesser version of Berry could likely work as an above-average starter in the league, but the Chiefs will need him to be at his best if they wish to overcome their deficiencies elsewhere. The Berry-less 2017 Chiefs fielded the worst defense the team has seen during Reid’s tenure. Still, 2016’s unit wasn’t too great either, thanks to injuries to stalwarts such as Justin Houston and Derrick Johnson. Only one truth remains for the Chiefs: They’re dominant at Arrowhead. The Chiefs have largely transformed from a bottom-10 defense to a top-10 unit at home over the past three seasons. Home (24 games): 16.2 points, 223.8 passing yards, and 116.3 rushing yards per game allowed; 27+ points allowed in 8% of games. Away (24 games): 22.9 points, 259.8 passing yards, and 108.6 rushing yards per game allowed; 27+ points allowed in 39% of games. It’s probably still not wise to mess with the Chiefs at home, but their secondary has plenty of question marks heading into 2018. Former No. 1 corner Marcus Peters and the artist formerly known as Darrelle Revis have been replaced by ex-Redskins slot corner Kendall Fuller and ex-Tyreek Hill punching bag David Amerson. This isn’t to say the offseason was a complete loss for the Chiefs. Fuller was Pro Football Focus’ No. 5 overall corner last season, but he still served as the Redskins’ Robin while Josh Norman played the role of Dark Knight. The Chiefs also handed ex-Cowboys linebacker Anthony Hitchens the league’s fourth-most valuable contract among inside linebackers to help boost their front seven. It’s tough to see the Chiefs being one of the league’s worst pass defenses as long as Berry is playing at a high level, but their margin for error certainly appears to be slim given the turnover at cornerback. While their days as a top-five unit might be over, their dominance at Arrowhead should keep them out of the cellar among defenses in the league. It remains to be seen if Berry will return to his all-world form, but to this point, he he’s never given us a reason to bet against him. At the very least, it would behoove fantasy investors to avoid opposing tight ends as long as Berry is in the lineup. 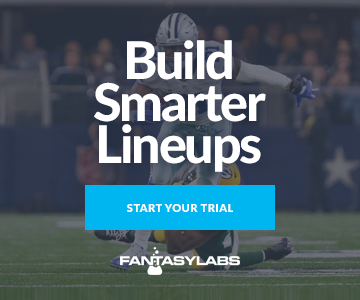 Why the Spread Matters Less Than You Think for NFL DFS 2018 NFL Combine Day 2 Review: Love Him or Hate Him, Josh Allen Is Athletic Dak Prescott: 2018’s Most Undervalued Fantasy QB? Jameis Winston: What’s the Fantasy Impact of His Suspension?